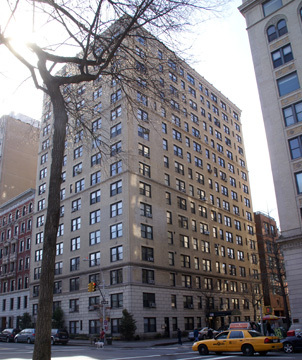 This very attractive apartment building at 327 Central Park West was designed by Nathan Korn in 1928 and converted to a condominium in 2001. 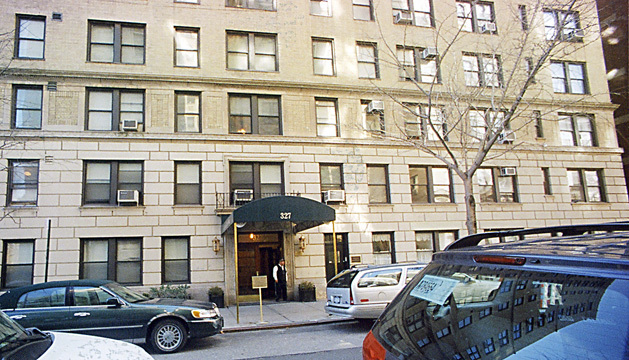 It has 89 apartments and is also known as 2 West 93rd Street. The Columbia Grammar and Columbia Preparatory Schools on nearby on the sidestreet as well as a very attractive row of townhouses. The 16-story building has a canopied entrance on the sidestreet, sidewalk landscaping, a doorman, private storage, consistent fenestration and a two-story rusticated base. It has narrow bandcourses above the 2nd, third, 7th, 11th and 15th floors and a small cornice. It has no garage and no roofdeck, but is pet-friendly.